Mr. Noah has quite the start-up resume. 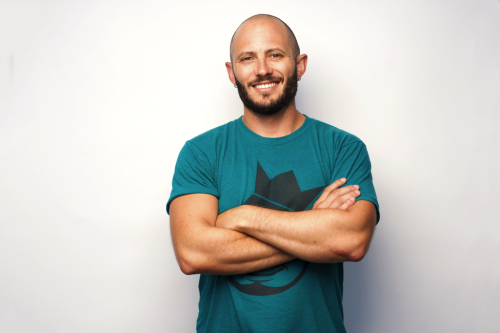 The purpose of this post is simple: to teach you how to get a $1,000,000 business idea off the ground in one weekend, full of specific tools and tricks that Noah has used himself. For some reason, people love to make excuses about why they haven’t created their dream business or even gotten started. This is the “wantrepreneur” epidemic, where people prevent themselves from ever actually doing the side-project they always talk about over beers. The truth of the matter is that you don’t have to spend a lot of time building the foundation for a successful business. In most cases, it shouldn’t take you more than a couple days. We made the original product for Gambit in a weekend. Same deal for AppSumo. We were able to build the core product in one weekend, using an outsourced team in Pakistan, for a grand total of $60. Don’t get me wrong–I’m not opposed to you trying to build a world-changing product that requires months of fine-tuning. All I’m going to suggest is that you start with a much simpler essence of your product over the course of a weekend, rather than wasting time building something for weeks… only to discover no one wants it. Step 1: Find your (profitable) idea. Review top sellers on Amazon. Find products that already have guaranteed customers, then build something complementary. A good example of this is Dodo making a gorgeous $60 case to buy for your iPad (which costs over $500, and over 5 million sold). Think of all the things you do on a daily basis. Anything done more than once has potential for a product or service to improve the process. For me, one of those products was a mirror I could hang in the shower. It saves me tons of time while shaving, and now I don’t know how I ever lived without it. Be cognizant of products you use and frequently complain about. Before Gambit, we were constantly asking our payment tool partners for certain features, yet our requests were always rejected. That was the impetus for us to create Gambit for our own games. Check completed listings on eBay. This allows you to see how well certain products are selling. It’s also an easy way to measure sale prices of items and gauge the overall percentage of the market that’s receiving bids (i.e. in demand). Look for frequent requests on Craigslist gigs. These listings are from people actively searching for someone to give their money to in exchange for particular services. Try searching for certain keywords (e.g. marketing, computers, health) and keep track of the total number of results displayed. Evaluate the most popular keywords and see if you can create a product or service around those requests. Explore popular backed projects on on Kickstarter. See what people are wanting on Reddit. So many times in the DIY sub-redditI see people asking to buy what someone just made. There are hundreds of potential customers asking to give you money. Listen here to help come up with more business ideas. Now that you’ve found an idea that people are willing to spend money on, it’s time to assess whether there’s a big enough pool of prospective buyers. In this step, you’ll also want to ensure your market isn’t shrinking, and that it fares well compared to similar markets. 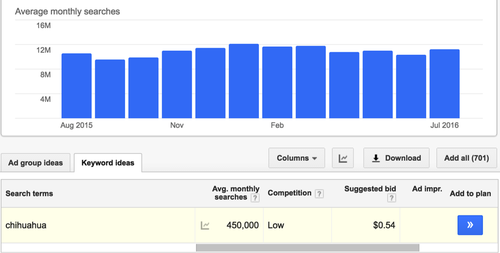 I use Google Trends, Google Keyword Planner, SEMrush, and Facebook ads when I’m in this part of the process. They’re great tools that help me evaluate the growth potential of my target market. 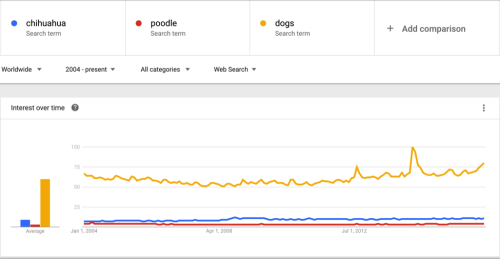 With Google Trends you are just looking for relative significance. 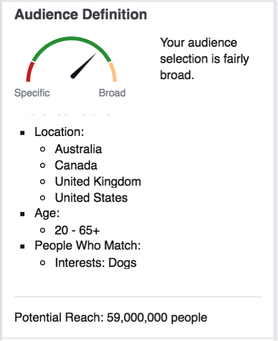 If you are targeting dogs this will show you which type of dogs are the most popular. You can do this in other verticals like should you build for Android or iPhone or should you put your software on Shopify or BigCommerce. 3. Alternatively try out the keyword on SEMrush to see how the search volume looks. 59 million. Not bad, not bad. You can also see if there is a large property that you can piggyback on, and funnel traffic from. Paypal did this with eBay, AirBnb is doing it with Craigslist home listings, and AppSumo looks to the 100 million LinkedIn users. If you can find a comparable site with a large number of potential customers, you’ll be in good shape. What helped me with finding $1,000,000 worth of customers for AppSumo was studying my successful competitors; specifically, Macheist. Their site did a Mac-only deal that generated more than $800,000. 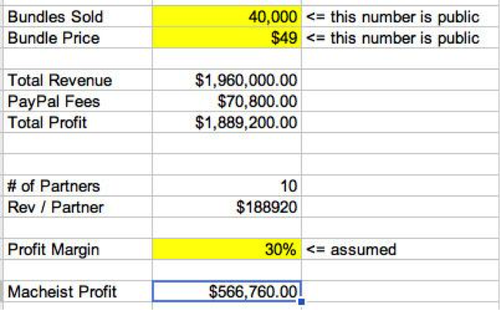 Macheist shares their sales revenue publicly, but you can use your own business acumen on the CrunchBase or Angel.co to see which business you want to replicate. For instance, you might research Airbnb.com, discover that they have a profitable and growing marketplace, then decide to create a similar service for RVs (like RVshare did). Step 3: Assess your customer’s value. 1. Find out how much it costs, on average, to buy a Chihuahua (about $650). This is the base cost. 2. See how much it costs to maintain a Chihuahua each year (i.e. recurring costs). Looks like it’s between $500–3,000. For this example, we’ll call it $1,000. 3. Look up their life expectancy, which is roughly 15 years. This is the number of times they’ll have to pay those recurring costs. Damn… you could buy a lot of tacos with that kind of cash. Silly dog owners. In any case, these owners are already committing to spend a LOT of money on their dogs (i.e. they are valuable). After putting down $650 on the dog itself and an average of $80/month on maintenance (a.k.a. food), spending $50 on an information product that could help them train their Chihuahua–or save money, or create a better relationship between them, etc.–does not seem unreasonable. Of course, the product doesn’t have to cost $50, but we now have some perspective for later deciding on a price. Now we need to utilize the TAM formula (a.k.a. Total Available Market), which will help us see our product’s potential to generate a million dollars. If TAM > $1,000,000, then you can start your business. 1. 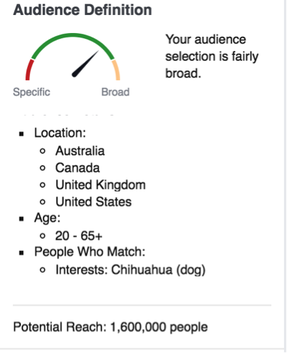 This is only through Facebook traffic. 2. This is only for one breed of dog. If you find success with Chihuahuas, you can easily repeat the process many times with other dog breeds. 3. This is only for one product. It’s far easier to sell to an existing customer than it is to acquire new ones, so once we’ve built up a decent customer base, we can make even more products to sell to them. By all measures, it appears that we have a million dollar idea on our hands. Now we can move on to the final step! Step 4: Validate your idea. By now, you have successfully verified that your idea has that special million-dollar-potential. Feels good, right? Well, brace yourself — it’s time to test whether people will actually spend money on your product. In other words, is it truly commercially viable? This step is critical. A lot of your ideas will seem great in theory, but you’ll never know if they’re going to work until you actually test your target market’s willingness to pay. For instance, I believed AppSumo’s model would work just on gut-feeling alone, but I wasn’t 100% convinced people wanted to buy digital goods on a time-limited basis. I mean, how often do people find themselves needing a productivity tool (compared with, for instance, how often they need to eat)? I decided to validate AppSumo’s model by finding a guaranteed product I could sell, one with its own traffic source (i.e. customers). Because I’m a frequent Redditor and I knew they had an affordable advertising system(in addition to 100 million+ monthly users), I wanted to find a digital good that I could advertise on their site. I noticed Imgur.com was the most popular tool on Reddit for sharing images, and they offered a paid pro account option ($25/year). It was the perfect fit for my test run. I cold-emailed the founder of Imgur, Alan Schaaf, and said that I wanted to bring him paying customers and would pay Imgur for each one. Alan is a great guy, and the idea of getting paid to receive more customers was not a tough sell. The stage was set! Before we started the ad campaign, I set a personal validation goal for 100 sales, which would encourage me to keep going or figure out what was wrong with our model. I decided on “100” after looking at my time value of money. If I could arrange a deal in two hours (find, secure, and launch), I wanted to have a return of at least $300 for those two hours of work. 100 sales ($3 commission per sale) was that amount. By the end of the campaign, we had sold more than 200 Imgur pro accounts. AppSumo.com was born. Drive traffic to a basic sales page. This is the method Tim advocates in The 4-Hour Workweek. All you need to do is set up a sales page using Unbounce or WordPress, create a few ads to run on Google and/or Facebook, then evaluate your conversion rate for ad-clicks and collecting email addresses. This is how we launched Mint.com (see one of our original sales pages here). You are not looking for people to buy; you are simply gauging interest and gathering data. Email 10 people you know who would want your pseudo-product, then ask them to send payment via Paypal. This might sound a bit crazy, but you’re doing it to see what the overall response is like. If a few of them send payment, great! You now have validation and can build the product (or you can refund your friends and buy them all tacos for playing along). If they don’t bite, figure out why they don’t want your product. Again, the goal is to get validation for your product, not to rip off your friends. Of course, there are other techniques for validating your product (like Stephen Key leaving his guitar pick designs in a convenience store to see if people would try to buy them). However, I’ve found these two methods to be super efficient and effective for validating ideas online. No need to get fancy if it does the trick. Here’s a few ideas below in case you are not a dog lover. For the people that just NEVER have a great idea. Here are 6 ideas that you can do today. Don’t worry, every business has competition and has been done already. If you’ve never heard of the company already providing this specific service, it means you have an opportunity! Virtual eBay merchant. Pick up stuff from your friends and neighbors houses. Sell it, then give them 50% of the profits (I really want this). Reduce credit card transaction fees. These companies take 3% for doing very little. How can you fix that? What other companies are taking high margins that you can beat? Tinder specialist. Many wealthy guys don’t want to spend the time creating a profile, texting and arranging dates. Do this for them. Virtual Reality Realtor. Go sell to local realtors the ability to have 3D / VR tours for them to offer to their clients. On the flip side, you can charge the consumer to go and take tours of houses on their behalf. Rich person apprentice. Rich people have more money than time. Go see what has been on their to-do list for longer than a week OR see if they have investments they are interested in and want someone to do the research. Home Automation Expert. The number of “internet of things” devices is growing rapidly and more people want their houses totally connected. Own it. Btw, if you are looking for additional resources and support in creating your own business, check out this course that’ll walk you through it..
We made it! You officially have a $1,000,000 idea on your hands and you know for a fact that people are willing to pay for it. Now you can get started on actually building the product, creating your business, and freeing yourself from the rat race! – You are inspired. Check. – You want to do something. Check. – You get a link to a funny YouTube video, then you open up Facebook. Check. – Suddenly, everything you thought you were going to do goes down the drain. Check. – I softly weep. Check. Don’t let this post become another feather in your Wantrepreneurship cap. Just follow the steps and start working towards your $1,000,000 business! Remember, you can start laying the foundation for your product without building anything. All you need is one weekend. P.S. Once your biz website is up and running, make sure to use Sumo to get more customers, make more $$$, and eat even more tacos. Want to Win Every Day?